Whether you're planting a garden, maintaining your lawn, or establishing a wildlife plot, applying the proper nutrients at the correct rate can save you money and help you achieve your plant-growth goals. Our office processes your soil samples and can make recommendations to help you achieve the results you need. We even have soil probes and augers available for loan to assist you in collecting your samples. 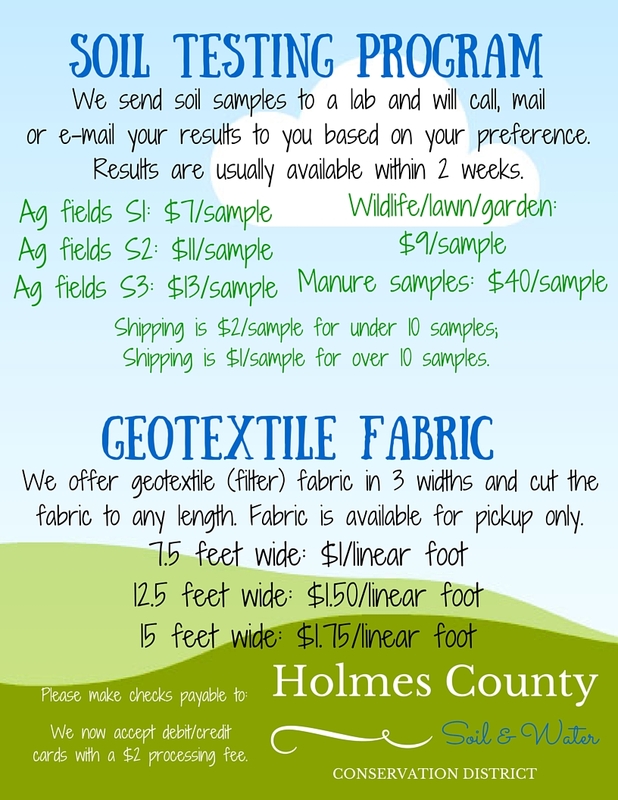 Soil samples may be dropped off at our office Monday - Friday from 8 a.m. until 4:30 p.m. Click here for current soil sample fees. All new or re-platted subdivisions require a Sediment and Erosion Control permit to be filed with our office. There is no cost for a permit for a re-plat with no planned construction, single-family residence construction requires a $10 fee, and subdivisions with three or more lots require a $25 fee. Permits can be obtained from the office Monday - Friday from 8 a.m. until 4:30 p.m. Forms may also be downloaded and mailed to our office along with payment. For more information on erosion control, check out our Erosion Control for the Homeowner publication online. Are you looking for information about property you own or are looking to purchase? Soil Survey books are available at no charge from our office. Soil surveys can also be accessed online. Our office sells geotextile filter fabrics in three different widths to meet your landscape or construction needs. Our fabric is especially popular when installing or improving driveways. Available widths are 7.5, 12, and 15 feet wide. Fabric is sold by the linear foot. Please call ahead to ensure staff are available to cut fabric for you. Click on the link to the left for current pricing details. NEW! You can now order fabric online! Our annual tree sale occurs in the spring. This year we will be accepting orders through March 14 with pick up on April 6 from 11 am until 5:30 p.m. at the Holmes County Highway Garage. We offer a variety of coniferous, deciduous, and ornamental trees at reasonable prices. Click here to be added to our tree sale mailing list. You can also download a 2017 order form as well as NEW for 2017: You can now place your tree sale order online!